If you are a cyclist and you live in Salt Lake City, the choice in the 2015 mayoral election is crystal clear – Ralph Becker. 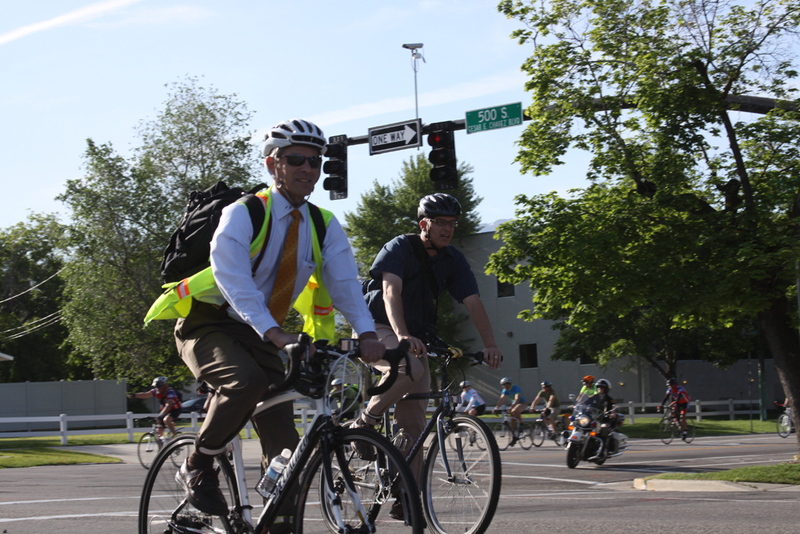 Becker is a local and national leader in bringing bicycle infrastructure and programs to Salt Lake City. Since taking office, the budget for bicycle related improvements has gone from $50,000 to $4,000,000 per year. The number of staff members working on bicycle issues in the Transportation Division has gone from one person to having bicycling be part of each job in the Transportation Division. Over the last 30 years, bicycle infrastructure has increased at a slow and steady rate until 8 years ago when Becker took office. Host to several stages of the internationally famous Tour of Utah bike race. Increased miles of bike pathways including the 9-line and the Sugarhouse Streetcar pathway. An almost complete Bicycle Boulevard on 600 E.
Bike Safety programs in progress. Large increase in the amount of bike lanes. Becker also has a strong record on the environment. He was the architect of the Mountain Accord planning process, which is moving forward to consensus in our beloved Wasatch Mountains. The Accord also contains key pieces on road cycling and mountain bike trails. It is crucial the Becker be re-elected for this process to continue. It is also crucial for cyclists to that Becker be re-elected to maintain and increase the momentum Salt Lake City has towards becoming a great cycling city. He is a biking mayor. He deserves your vote in the upcoming election and third term for cycling.